The $97 overhaul of downtown Minneapolis’ Target Center will feature lots of glass, a metal skin and better connections to downtown and Target Field, based on renderings released Tuesday. A City Council panel viewed the draft images as they approved hiring Architectural Alliance and Sink Combs Dethlefs to design a new home for the Minnesota Timberwolves, Linx and major musical acts. “An anthill” and “one of the ugliest buildings in town” were among the descriptions of the existing city-owned building, opened in 1990. Based near Loring Park, Architectural Alliance has played a role in many large civic projects in Minneapolis, including the Guthrie Theater, the Central Library, TCF Bank Stadium and the federal courthouse. Denver-based Sink Combs Dethlefs specializes in designing sports arenas and will be more focused on the interior work at Target Center. Costs for the renovation, which includes extensive interior changes, are being split between the city, the Timberwolves and building operator AEG. Johnson said construction could begin in spring 2015. 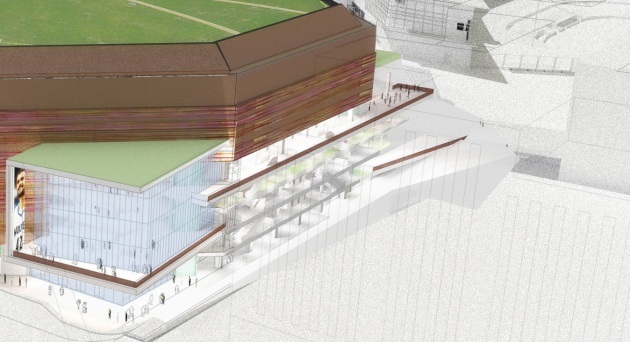 And below is a close-up of the connection between Target Center and Target Field.